I'VE MOVED! U-Haul packed! Directions to housewarming party. My sweet new welcome mat! Shoes and shirt not required. I've packed up the fine plastic ware, boxed the futon, used my 15 editions of What to Expect When You're Expecting to provide traction to get the U-Haul out of the mud puddle in my driveway, and have moved. Like the Beverly Hillbillies, I'm leaving this cozy home I've grown to love looking for Texas tea and swimming pools. If you are currently subscribed as a google friend/reader (THANK YOU! ), please be sure to subscribe over at the new site. There is some Internet-y, web designer-ish glitch-o-majigger that does not allow those subscribers to transfer (excuse my mild panic attack). SO, when you click on my new link, be sure to subscribe via e-mail or through Networked Blogs, 'cause, I need you. For reals. For those of you who have been here since day 1, I hope you're ready to make this move with me. All of your comments have been lovingly placed in bubble wrap and are already waiting at the new McMansion. Thank you for ONE YEAR of memories, laughs and friendship. Now, let's go christen the new pad. I've got the champagne. You bring the Velveeta. In the early morning hours of February 11, 2006, a woman I had grown to know and love died. We had a tumultuous relationship. At times, unhealthy. Often complex. There were great successes and disappointments, but, after 26 years, we had reached an awareness of being that I had confused for readiness. Ten months earlier, I convinced myself that it was time. On February 11th, at a time of night when blurry-eyed patrons were leaving bar stools and dance floors for the comforts of home, my first daughter was born. She was born and, in that moment, 26 years of who I thought I was; who I had been, died. In that moment, I was reborn. I looked at her small face in the sterile, plastic bassinet to my left. Beautiful. Small and helpless. What had we done? I looked at my husband. "I have NO idea what I'm doing!" He smiled and said, "I know." 26 years of living toward and for this moment. She was here. Who was I? A newborn in my role standing guard over my newborn daughter. We were as one in the fresh wonder and wound of birth. Her as a daughter. Me as a mother. We would figure this out together. She would not nurse. In the hospital bed, in a new body I had never worn, my breasts tender and heavy with milk she could not drink, we would both cry in unison. I was sharing a room with a veteran. She was calm. She slept. She laughed uproariously with her guests. Her son nursed effortlessly. This simple act bringing me my first taste of maternal jealousy by the hands of the wicked comparison. On my first night, after finally dragging my husband out of the room with the gentle reminders from staff that turned stern, I placed my daughter on my chest to breathe in the intoxicating smell of new life, pure and unlike anything else. Otherworldly. As I would, in my later veteran days call it, Maternal Crack. As I sat, alone, with my sweet smelling and crying newborn, my roommate pulled back her curtain, breaking our imagined barrier and said, "Is this your first?" I nodded and smiled. She smiled back and said, "You are going to be great. It's going to be wonderful. She is beautiful." This simple act bringing me my first taste of the bond of love that exists in its rawest form between mothers. 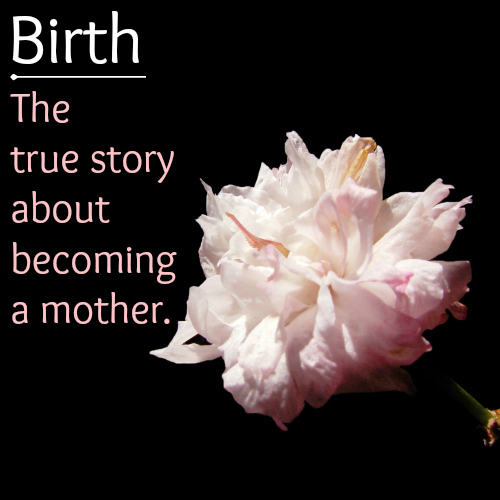 The next morning, in the maternity ward shower, my heart pounded loudly and without interruption in my ears. The fear of being away from my daughter so profound. Yet, the feeling of the water against my worn body, so luxurious. I couldn't help but enjoy the feeling of lightness of my newly empty womb, the silence of the bathroom and the escape from the hospital gown. The push-pull of my need of her and need of a shower bringing me my first taste of maternal guilt. I convinced the nurses that I needed to stay for an additional day. She had a mild case of kidney reflux. Breastfeeding was still not going well. She was slightly jaundiced. They were gracious and kind. I was terrified. For our last night, we paid for a private room out of pocket so my husband could spend the night with his new family. A luxury we could not afford but could not find a way to turn down. My husband ran to the billing department, credit card in hand. He came back with the receipt, our ticket to familial solitude, and the private room service menu. "I knew they gave better food to the private roomers!" I whispered. My husband smirked as we pushed our tiny daughter in her same plastic bassinet to our new room, chuckling nurse chaperon by our side. The next day, it was time to go home. Time to become her mother, unassisted. No more of the nurses I had grown to love. No call buttons or simulated nursing systems. No doctors to check her vitals and reassure me of her health and vitality. It was just us. Newborn baby girl. Newborn mom. We would figure this out together. When my husband came to pick us up, nervous and with unused car seat in hand, he found me sitting on the hospital bed in ill fitting post-maternity clothing, crying. Our daughter in my arms and a cardboard box of paperwork, flowers and hospital issued newborn trinkets by my side. The box the only sign of my great transition. I gave birth, died, was reborn, and all of the proof of my great pilgrimage to Motherhood fit inside a cardboard box. I looked up, shoulders shaking and managed to sputter out, "I love her so much. I have no idea what I'm doing." He smiled though his own tears and said, "I know."